Go Colombia LLC, with the sponsorship of several non-profit organization are proud to present the 4th edition of the International Colombian Festival of Washington DC. In last year's festival, more than 4,000 spectators were in attendance, and the event was covered by the local newspaper and television stations, including well-renown Hispanic network Telemundo . We are anxiously looking forward to even greater success at this year's event, which will be held on Saturday, July 20 2019, from 11:00AM at 7:00PM at the RFK Fair Grounds in Washington, DC. 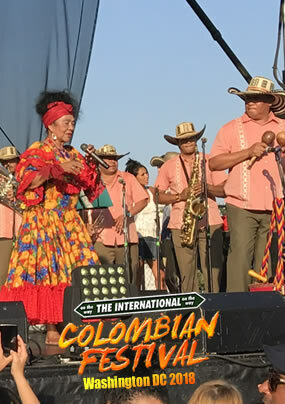 We are a proud partnership that brings a unique festival to promote Colombian culture, art, gastronomy, music, folklore and much more among the diverse population of Washington DC. We also aim to unite the Colombian Diaspora as well as the Latino community bringing them a bit of home to them! The original organizing team of last year's festival have team up to fund Go Colombia LLC , a special events production firm that connects culture, music, food, folklore to audiences. With our events we also want to contribute to different social causes in Colombia that focus in education, rural development and art. For that goal, we are partnering with several non-profit organizations based in the US and Colombia to donate most of our proceeds to the social causes that matter. The Festival will take place at the RFK Fairgrounds located near the new trendy neighborhood of Navy Yard with has grown exponentially over the years, as it now ranked as the fastest growing neighborhood in Washington, D.C. In last year's festival more than 4,000 spectators attended, with the event being covered by the local newspaper and television stations, including major Hispanic Network Telemundo. Last year, we had the honor to count with the Participation of Colombian Grammy winner Toto La Momposina, and this year, we are anxiously looking forward to even greater success. This third edition will feature several artists, including famous renowned Colombian Latin Grammy Winner 123 Andres . It will also count with the participation of Colombian salsa and vallenato bands and other local groups, including La Colombopercutiva and De San Guashinton. Sixty percent of our spectators are Colombian-Americans, which are considered the seventh-largest Latino group and the largest South American Latino group in the United States with more than 21,000 living in the DMV area according to a 2015 census. Company's Logo integrated on festival's website & social media outlets. 10'x10' premium vendor booth space w. (1) 8ft tables, (6) chairs & tent. Corporate representative to introduce headline act. Opportunity to sample, give coupons, display & sell your merchandise/products directly to the public. Sponsor logo on LCD TV screens visible from stage. 8 stage announcements promoting company as an official sponsor. 12 tickets, access to VIP lounge and 24 complementary drink tickets. Logo on the festival program front page (5,000 Printed Festival Programs to be handed out at the main entrance). Sponsor's Logo inclusion in step & repeat banner placed in main stage of the festival. Logo on all printed flyers (5000 bilingual flyers & 200 Posters). Exclusivity as the only company from your industry. 3 minutes on stage sponsor introduction to the attendees during festival. 10'x10' Premium vendor booth space w. (1) 8ft tables, (4) chairs & tent. 3 stage announcements promoting company as an official sponsor. 6 tickets, access to VIP lounge, and 12 complementary drink tickets. Logo in festival program (5,000 printed festival programs to be handed out at the main entrance). 10'x10' Premium vendor booth space w. (1) 8ft tables, (2) chairs & tent. Opportunity to sample, provide coupons, display & sell your merchandise/products directly to the public. 1 Stage announcement promoting company as an official sponsor. 3 tickets, access to VIP lounge, and 6 complementary drink tickets.